Gorgeous three-bedroom three-bathroom home with plenty of room to live and play! 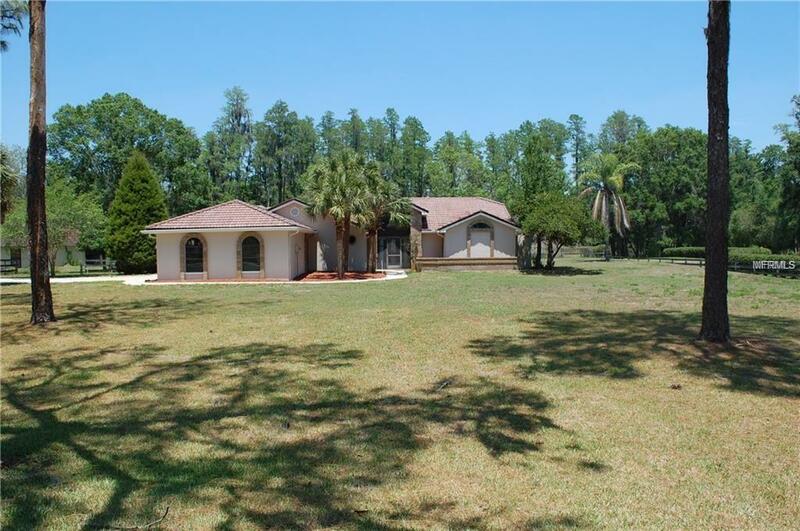 This lovely home is located in the very sought out equestrian community of Pasco Trials. This large estate encompasses over 2.5 acres, giving you space to enjoy your new property! Inside, the home features updated white cabinets, granite countertops, and stainless-steel appliances! For chilly nights, save electricity enjoying the cozy fireplace, with custom brick detail extending all the way to the ceiling. Living areas have ceiling fans and cathedral ceilings. Multiple gorgeous French doors lead you to the screened lanai, and the huge pool and relaxing spa. Seller replaced the roof September 2018!! This home also includes a large horse barn/stables. Enjoy tranquil conservation views of nature around you in your own private oasis! This is a Fannie Mae HomePath Property. Amenities Additional Fees Buyer is To Review Hoa Covenants To Verify Pet And Other Deed Restrictions. Seller Does Not Know And Only Presumes The information Provided To Be Correct.